Staff Photo by Dan Henry / The Chattanooga Times Free Press- 11/12/16. 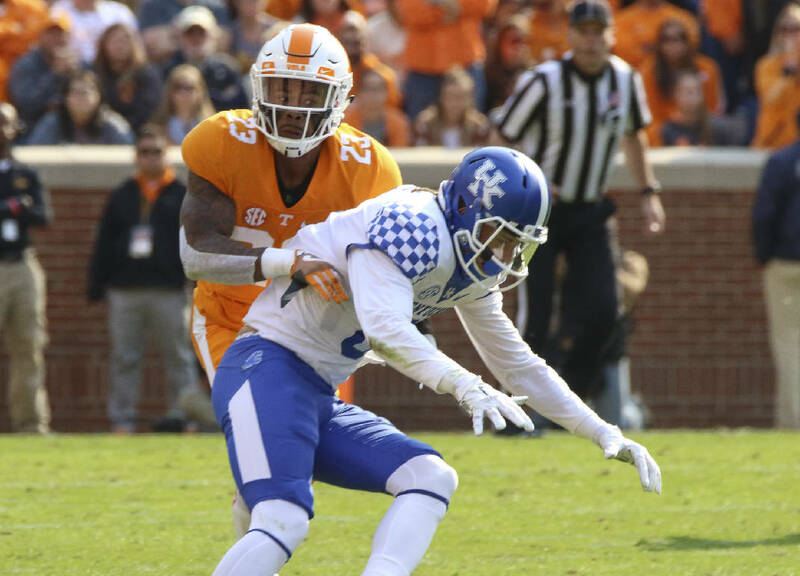 Tennessee's Cameron Sutton (23) defends as Kentucky's Blake Bone (6) receives a pass during the second quarter of play. The Tennessee Volunteers won over the Kentucky Wildcats with a final score of 49-36 at Neyland Stadium in Knoxville, Tenn., on Saturday, November 12, 2016. KNOXVILLE — It was August, long before injuries would decimate Tennessee's football team and derail the Volunteers' national championship dreams. In a happy UT locker room beneath the Neyland Stadium stands, running back Alvin Kamara was explaining why he bypassed last spring's NFL draft to return for his redshirt junior season. "You don't owe anybody anything in this business," he said. "But I felt I owed it to these guys to stay here. I wanted to come back and help my teammates do something special." That special thing he was talking about was winning the SEC championship game and advancing to the College Football Playoff. The Vols were in everybody's top 10 in those days. They were going to play nine of 12 games on Tennessee soil. Then Cam Sutton went down. And Jalen Reeves-Maybin. And Darrin Kirkland Jr. And Shy Tuttle. And Kahlil McKenzie. And Kamara. And Jalen Hurd quit the team. And suddenly, shockingly, the Big Orange team that the Big Orange Nation expected to cheer was nowhere to be found. But Sutton and Kamara wouldn't call it a year, even if that might have been the smartest long-term solution for their probable pro careers. They hit the training room seven or eight times a day. They supported and instructed their teammates from the sideline. They never missed team meetings. And then Saturday came against Kentucky in a game that could have eliminated the Vols from contention to win the SEC East. Sutton and Kamara suddenly reappeared in uniform for the official coin flip. Then they played exceedingly well, almost like they'd never been hurt at all. "What can I say about the return of Alvin Kamara and Cameron Sutton?" coach Butch Jones said. "I think that's a great story. They're selfless individuals who put the team first and really wanted to play. They were determined and they willed themselves to getting back healthy. I thought that really sparked our football team." If so, it sparked the Vols to a 49-36 win over UK, a win to possibly win the SEC East should the Vols win out against Missouri and Vanderbilt and Florida loses at LSU. But regardless of what happens, the return of Sutton and Kamara was obviously touching to Jones and their teammates. "Cam being our best defensive back and Alvin being our best running back, having those two back and playing, at a high level, is always great to see," noted quarterback Josh Dobbs. Added defensive back Micah Abernathy regarding Sutton: "Just his brain really, that helps us out on the field. He knows plays before they come. He's just a smart player on top of his athletic abilities. Having him out on the field definitely helped us out a lot." Kamara's contributions were obvious. Despite his postgame proclamation that Dobbs, in fact, "is our best running back," Kamara's 128 net rushing yards and two touchdowns certainly looked impressive. But Sutton had his moments as well, especially on a pass breakup in the second quarter that denied UK a key first down. He finished with three total tackles. "Alvin and Cam both are captains of our team," said defensive lineman LaTroy Lewis. "Your captains and your coaches show the personality of the team. How badly and how hard they worked to get back speaks volumes." Added Jones: "It's just an attribute to those individuals. First of all, these individuals could have easily sat out and said 'I'm done' and started getting ready for the NFL, but instead they wanted to be a part of this football team and help us win, and to me that speaks volumes about their character and what this football program means to them." Perhaps to underscore that, Kamara said, "We've got unfinished business. Our season's not over." Especially if Kamara and Sutton are back for good.